The city is addressing this dangerous crossing on Atlantic near Pier 6 playground. Now, parents are concerned about Kane/Hicks. I was walking with a stroller just last summer, two 4-year-olds sitting in it (yes I know, but they were tired, it was efficient, and I paid the price: The stroller was kaput from then on), heading out from Pier 6 playground toward home. As we waited to cross over the entrance ramp to the BQE, along the bottom of Atlantic Avenue, standing on the sidewalk, I looked down at my phone to text someone. The next thing I know, the girls are screaming and a massive semi truck is swinging our way, making a wide turn onto the entrance ramp to the highway–coming RIGHT ONTO THE SIDEWALK, right at us. I yelled at the driver, and lurched backward just in time. We lived, but it was scary. It’s clearly dangerous. The driver laughed. Indeed with all the activities now along the waterfront, it’s increasingly hazardous for families who wish to get down and back and have to cross the crazy traffic heading to the BQE. The newest issue is that now that so many families are moving into the new and renovated spaces right across the Brooklyn-Queens Expressway from Cobble Hill and Carroll Gardens, along Columbia Street, Tiffany Place, Congress Street and in “Carroll Gardens West,” the parent-child foot traffic over the BQE in the mornings heading to P.S. 29 and P.S. 58 has increased. At the crossing at Kane Street and Hicks Street, in particular, parents say a traffic light or speed bumps are needed or else there’s going to be a tragedy. Truly, cars fly down Hicks and it’s always dodgy crossing that road. 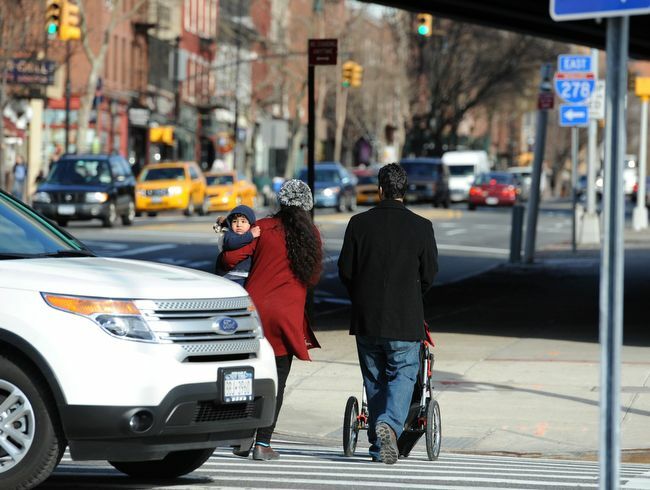 The city responded recently to calls from City Councilman Brad Lander, residents and others to slow traffic entering the BQE at the bottom of Atlantic Ave, where I and the two 4-year-olds almost perished. The city announced recently it will install a median in the road to slow traffic and increase safety at the Atlantic Ave. crossing. Read the full report on that crazy intersection. Let’s hope they’ll take a similar look at the Hicks/Kane Sts. crossing. Read more at The Brooklyn Paper.